About 4,500 people in Northern Ireland are receiving a Personal Independence Payment (PIP) for living with fibromyalgia - but as many as one in 25 people may actually be affected. 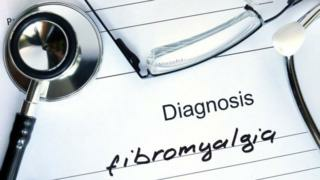 Fibromyalgia is a long-term condition that causes pain all over the body and it can be difficult to detect. For almost a decade, nobody could tell Margaret McCully why she was in pain. "It got to the point where I actually thought that I was going crazy, that these pains were in my head," she said. "You get medication thrown at you and hope it takes the edge off it. There is nothing that will take the pain away." Margaret was eventually diagnosed with fibromyalgia 15 years ago. She said it left her feeling very isolated. "I had to give up work because of it," she said. "Whenever I got the letter to say the forms were coming out I literally freaked because I did not know how I was going to fill them in," she said. "I had to get some help with that. "Lucky enough I was given what I would call high mobility. But I have only got it for four years." Lyndsey Milligan said she managed to return to work after being diagnosed with fibromyalgia in her 20s. "I was getting very depressed at home," she said. "I could not cope with the fact this was my life. I loved getting out and doing things and it was really frustrating for me." Lyndsey set up her own beauty business and found that being self-employed helped her manage her condition. "I did not want the stress of worrying about 'am I going to be able to go into work tomorrow? Am I going to have to call in sick?'" she said. "I can work around my health. If I feel myself deteriorating I can amend my days. "I can look at the weeks ahead and see 'ok maybe I need to cut back here or you know I can take on a wee bit more here and have a couple of days off.'" Dr Michael McKenna said it requires "a diagnosis of exclusion". "We will always go in and look for other causes of the symptoms," he said. "Conditions like rheumatoid arthritis or connected tissue diseases would need to be ruled out." Dr McKenna said GPs are getting better at diagnosing it because of familiarity. "Many years ago this disease was thought to be psychosomatic, but now we know that actually it is the debilitating illness that we suspected. We do not know exactly what causes it," he said. "There are a number of triggers that are related to it, for example trauma is very significant and it seems to be common in women, but it is certainly something that is very real. "There is no cure. It comes in various intensities. "It does tend to wax and wane, so we do see times where people have better weeks and times when they do not." Dr Christine McMaster, from the Health and Social Care Board, said more is being done to help people who suffer from fibromyalgia. Image caption Dr Christine McMaster said more is being done to help people who suffer from fibromyalgia. "We have developed a pathway that describes what kind of tests should be done and, once a diagnosis is made, what kind of interventions are there for people and how they can help themselves," she said. Work is also ongoing with GPs to offer the right treatment to patients. "What unfortunately still happens is that large numbers of these patients are sent to secondary care for diagnosis and the waiting lists there are long, especially for rheumatology and that can mean that patients wait for years for a confirmation of their diagnosis," Dr McMaster added. "The condition is best managed in primary care, but that only works if GPs have access to the kind of support their patients need, namely in physiotherapy or support management programmes. "The approach we are taking is that in GP practices, there will be one or two that are fairly well experienced in fibromyalgia, who can advise patients and their colleagues what is best in terms of management."